it's here! studio calico january kit - copper mountain is live! this is my first kit in studio calico scrapbook team so this is a special kit for me. 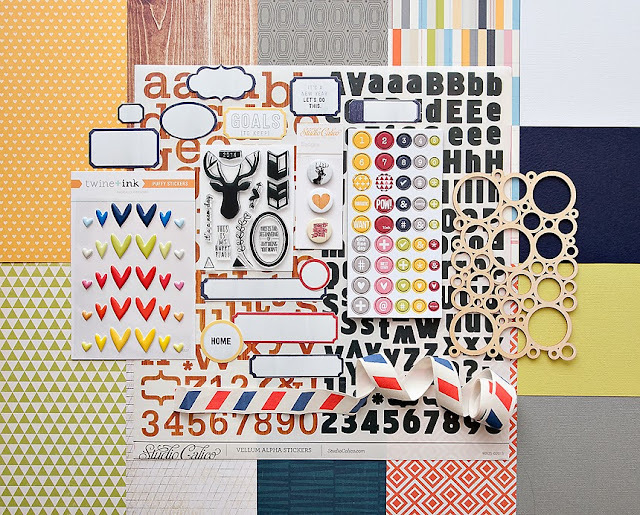 i love the colours, the beautiful papers and embellishment in this kit. favourite items have to be the wood grain paper, wood veneer, chipboard dots, puffy hearts and the cute mini badges. this is a main kit only layout. i started this layout with the woodgrain paper as my background. i love the wood veneer and wanted to use it as a backing for my photo. i painted the wood veneer with white acrylic paint so that it will stand out better against dark paper. i added some patterned paper and vellum under the wood veneer to create some layers, then i filled up each of the circles with the colorful chipboard dots, a mini badge and stamp. to create the soft and dreamy feel I was looking for, i cut this month's star cut files by catherine davis using my silhouette cameo and vellum paper. this is a main kit only layout. this layout started with this month's journaling card cut files by in a creative bubble. i love the hearts journaling card cut file so much i created a background with it. once my cut file is ready, i back it with the patterned paper and my background was ready. i placed my photo in the middle of the page and started layering the hearts from the cut file around it. to add more colors and layers to this layout, i used one of the hearts as a guide and hand cut more little hearts from vellum and the different patterned paper in the kit. to finish this layout, i added some puffy hearts, the airmail ribbon and some ink splatters using mr huey mist. for this layout, i used a mix of the main scrapbook kit, high point and fremont glades. I used the circle wood veneer as a stencil to create the background for this layout. I used a pencil to trace out the circles and used watercolor to paint. The fun part was to embellish the circles with the bits and pieces from the kits. this is one of my favourite photos of ethan. i love how this photo captures how much fun he had playing with the balloons under the hot sun! i wanted this photo to be the focus of my layout, so i kept it simple and finished with the hello cut file by hello forever as the title. 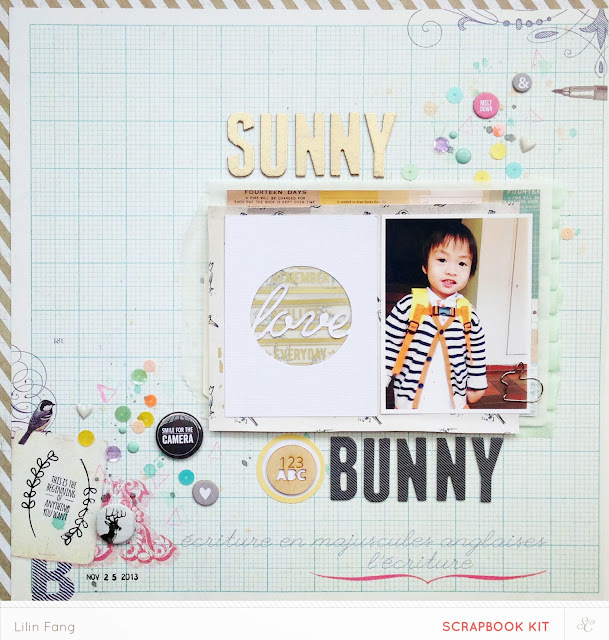 i used a mix of the main scrapbook kit, high point, fremont glades and slingshot for this layout. ethan started going to pre nursery about 2 months ago. I love this photo of him in his uniform and carrying his little bag. i started with this beautiful patterned paper by prima marketing - are you on my radius? from high point. for more interest, i used the gold rub ons by hello forever on a piece of vellum and placed it as a backing for the love journaling card by in a creative bubble. the rest of the layout came together with layers of glassine bag, patterned paper under the photo and bits and pieces of the embellishments spread along the mist splatters i added across the page. to finish off the page, i tuck some of the beautiful mint green ribbon under the photo and a cute bunny paper clip to hold the papers together. that's all for my first reveal at studio calico! thank you for dropping by and i hope you manage to purchase what you were planning to get this month. happy holidays!